Welcome to Katfrog's Corner: Monday Madness! 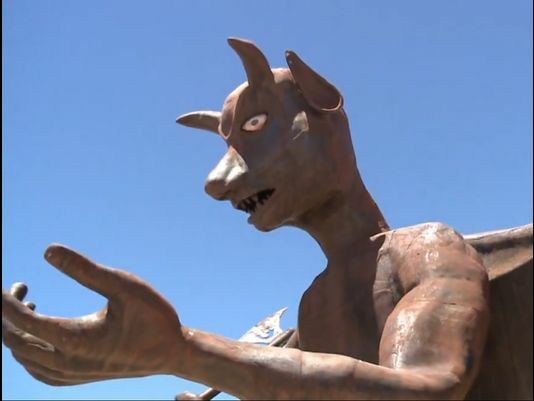 A man in Arizona, David Smith, created a stir in his new neighborhood by placing a nine-foot tall metal statue of a gargoyle in his front yard. The problem is that Mr. Smith attempted to make the gargoyle anatomically correct. You can read up on the specifics on a variety of news websites, but what I find funny is that no one has asked the important question here. How does Mr. Smith know what an anatomically correct gargoyle look like? After all, gargoyles are not real. A male gargoyle might look like a female until time to procreate. Then he might suddenly have a violin sprout between his legs, that magically transforms into a bar of dark chocolate that the female eats to get pregnant. It's all make believe. Here's a happy dance for you!!! Today, the Supreme Court rejected the Arizona law requiring people to provide proof of US citizenship to register for federal elections. I actually did a little happy dance for this one, because that law did not come out of reason or rational thought, but out of hate and fear. Proving they never stop, the FBI is still searching for Jimmy Hoffa's body, this time in a field about 20 miles north of Detroit. In 2008, a man called Tony Zerilli left prison. An alleged mobster, Zerilli claimed to know where the body was buried. The FBI investigated the claims, and now have a court warrant to search a large field for a shallow grave or for other signs of human decomposition. While these actions might seem like madness, I think it's important for the FBI to continue to work cold cases. Maybe they can provide any remaining family members with a real answer as to what happened to Mr. Hoffa. Maybe they can send a message to other criminals out there that no matter how much they try, the FBI will always follow up and will find answers. 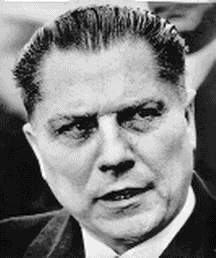 Maybe the general public just needs to know that the FBI cares enough to not give up, even on someone like Jimmy Hoffa.